Last week Gigabyte held a conference with its investors. As part of its guidance for the coming financial quarters, Gigabyte issued a warning about the turn-down in demand for graphics cards and the impact that could have on revenues. The headlining information regarding graphics cards is that shipments are expected to have dropped by about 20 per cent in the coming Q2 2018 report. In reaction to the weakened demand, Gigabyte says it has dropped average selling prices (ASPs) by 10 per cent. A large factor behind the drop in graphics card demand is the significant decline in exchange value of the most popular cryptocurrencies and the rise of better, more efficient, ways to mine them. As DigiTimes, the source of this Gigabyte investor chat info, reports - the crypto-mining craze seemed to reach a significant inflexion point in April. Around this time the economies of buying new GPUs and running them mining for profit went sour. 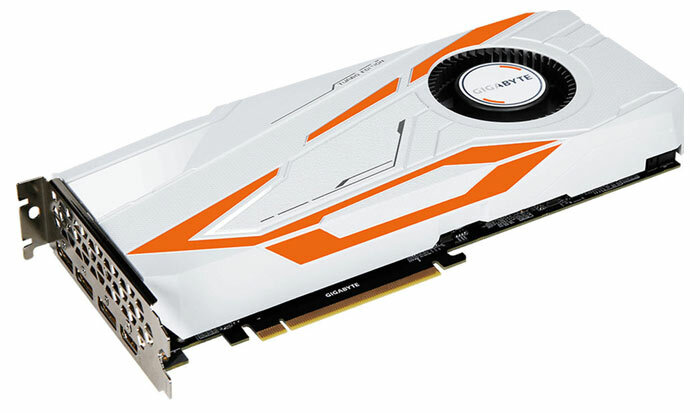 Gigabyte's graphics cards sales are expected to be approx 1.0 million in Q2. That's a fifth lower than Q1's sales figure of 1.2 million graphics cards. Now, to try and put the brakes on any subsequent fall, Gigabyte has decided to "focus more on promoting graphic cards for gaming devices in the second half of 2018," reports DigiTimes from the investor conference. It will also reduce ASPs, eating into the 49 per cent margin it had been enjoying earlier in 2018. Other companies, like Asus, MSI and Colourful are likely in the same boat as Gigabyte. The lack of new products from AMD and Nvidia, and the saturated markets for what they currently offer, mean that existing stocks have another reason to trend down in price. On the topic of upcoming Nvidia GPU launches, there are murmurings of a GeForce 11-Series launch at Gamescom on 21st August. Last week we saw an Nvidia engineering sample graphics card photo leak of a purported 'GTX 1180' packing GDDR6 but other indications are that Nvidia will be sitting on its hands until large stocks of unused GPUs are sold off. Prices are not going down. They are going back to the level they were supposed to be before the greed hit them all. it is awful feeling to know how we depend on the greed of somebody else to have the things in our life. So they have much more room to drop pricing than just 10%. Another reason to not buy now then. Waiting for one of the manufacturers/resellers to come out with “Lets make gaming great again” when they announce they are finally going to stop ripping off gamers.